Continue reading "River North Art District Grows Up"
Continue reading "UPDATE: Meeting did include information on the new sidewalk repair program, as well as the city’s need to fix “gaps” in sidewalks"
Continue reading "Westword’s “Hateful Eight” Lives on and on and on… happily"
Continue reading "Aaron Betsky and Architect Magazine consider an epidemic of “meh”"
Is the horse already out of the barn? Continue reading "Is the horse already out of the barn?" Oh, Landmark Preservation Commission: what’s next? Continue reading "Oh, Landmark Preservation Commission: what’s next?" 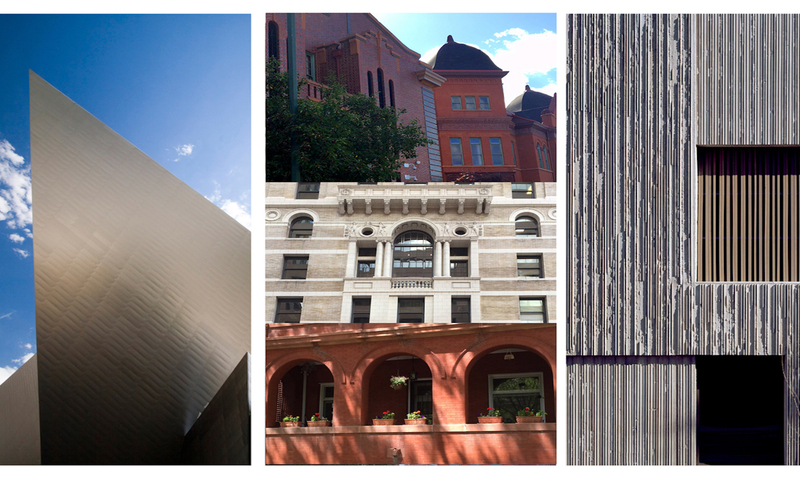 Left: the Denver Art Museum’s Frederic C. Hamilton Building, Courtesy of the Denver Art Museum; center, from top: a North Capitol Hill balcony, Equitable Building detail, and Dora Moore School, by Mary Voelz Chandler; right: Clyfford Still Museum detail, by Jeremy Bitterman, Courtesy of the Clyfford Still Museum. Chandler photograph by Cyrus McCrimmon.